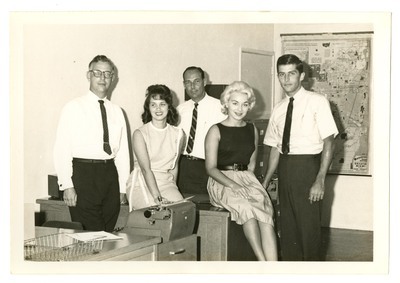 "Blue Cross of Florida Inc. and Blue Shield of Florida Inc. Miami Branc"
Pictured: Bill Opper, Mary Ann Heffernan, Ira Gould, JoAnn Hucks, and Chuck Faulkner. Photo Date: 1962. Newsletter Issue: News of the Blues 8/1962.